Norway’s coastline offers scenery on an epic scale. The immense size of the magnificent fjords, cascading waterfalls, picturesque fishing villages and dramatic snow-capped mountains are a sight to behold. Known as the lands of the Polar bear, the stunning Svalbard Archipelago will stay etched in your memory forever. 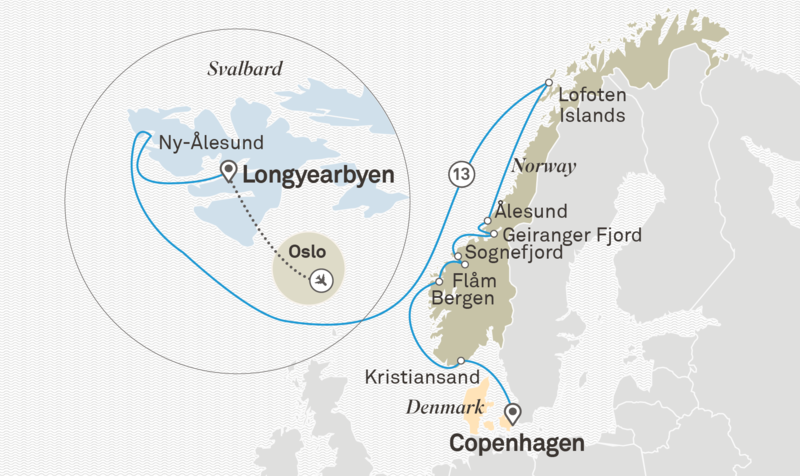 From Copenhagen, cruise the stunning Norwegian fjords and explore the polar wonderland of Spitsbergen, part of the Svalbard Archipelago. Witness immense glaciers and fjords, the Arctic tundra and be on the lookout for wildlife and migrating seabirds on this once in a lifetime journey. Welcome to Denmark’s thriving capital where you will be warmly greeted by the crew as you step on board Scenic Eclipse. Meet the Captain, crew and your Discovery Team before setting sail this evening. Day 12 - Svalbard Archipelago. Day 13 - Svalbard Archipelago.